Brock Lesnar will return to action on Friday, Dec. 30 against former Strikeforce heavyweight champion Alistair Overeem in Las Vegas. The news was first reported by the L.A. Times on Tuesday, with the UFC and UFC president Dana White also confirming the news via Twitter. The mega match-up will showcase two of the sport’s top heavyweights in a card that will cap off 2011 for the UFC at the MGM Grand in Las Vegas. The fight will be a five-round main event with the winner getting the next shot at the UFC heavyweight title against either Cain Velasquez or Junior Dos Santos. Velasquez and Dos Santos battle for the belt at the first UFC on Fox event on Nov. 12. Brock Lesnar returns to action for the first time in over a year when he gets back in the cage in December. The former UFC heavyweight champion was supposed to fight in June, but a flare up from his ongoing battle against diverticulitis put him back on the sidelines. Now healthy from his surgery, Lesnar returns to UFC action and has a very big task to tackle ahead of him. Former Strikeforce heavyweight champion Alistair Overeem officially moves over to the UFC following his brief exit from the Zuffa fold. He was removed from the Strikeforce roster after contract issues arose between his camp Team Golden Glory and the powers that be at Zuffa. The UFC continued to negotiate with Overeem and his camp and on Tuesday his deal became official. Now Overeem moves over to the UFC as one of the sport’s top fighters, and will get a big test when he steps foot in the Octagon on day one. Overeem will debut in the UFC without the Strikeforce heavyweight title, which he vacated when he exited the promotion just over a month ago. 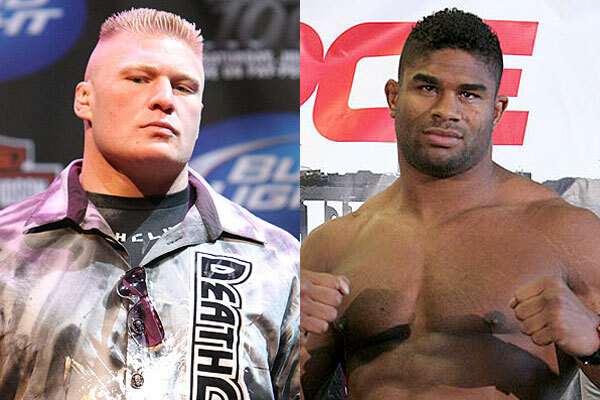 The bout between Overeem and Lesnar will go down on Friday, Dec. 30 at the MGM Grand Garden Arena in Las Vegas, presumably for an event that will be titled UFC 141.